On Monday morning, the American Library Association will announce the 2013 Youth Media Awards, including the Newbery and Caldecott books. As you might imagine, this is always QUITE an exciting day for me. You might also imagine that I’m something of a giant nerd. You’d be right on both counts. Over the last many months, I’ve been keeping tabs on the picture books that are getting some Caldecott buzz, and I’ve tried to read as many of them as I can get my hands on. These are some of my favorites here and if one of them does get the gold sticker come Monday, you know I’ll be feeling irrationally proud of myself. 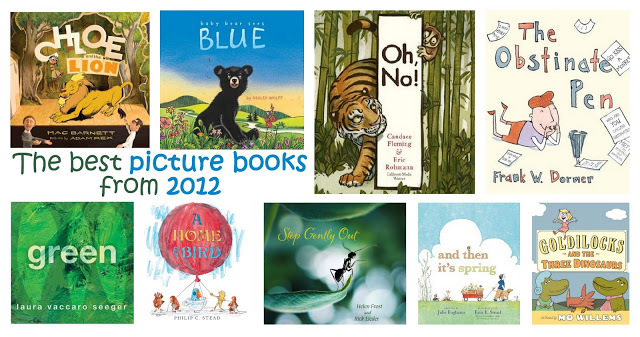 And if not, this is still a seriously good list of 2012 picture books. blog and I get to say what books are awesome). the author, so the illustrator quits and the author takes over. Baby Bear Sees Blue by Ashley Wolff – This one reminds me a bit of Blueberries for Sal, one of my all-time favorite books, but for a much younger audience. The colors are so vibrant and the pictures are gorgeous. for reading aloud to small children. The Obstinate Pen by Frank W. Dormer – People keep telling the pen what to write, but the pen writes whatever it wants, like “You have a huge nose.” Hilarious. it’s one of the best books ever. So clever with gorgeous illustrations. out. So sweet and clever. Step Gently Out by Helen Frost, photographs by Rick Lieder – This non-fiction title has the most gorgeous pictures of bugs (a sentence I never expected to write). And Then It’s Spring by Julie Fogliano, illustrated by Erin E. Stead. I just read this one at the library this week and it deserves all the buzz it’s getting. Sweet, gorgeous, and brief, about a little child planting a garden at the end of winter and waiting for spring. Goldilocks and the Three Dinosaurs by Mo Willems – I’m sorry, is there any child alive who doesn’t love Mo Willems? This spin on the classic tale will make you laugh. Just checked out "Goldilocks and the Three Dinosaurs" yesterday (along with "Don't Let the Pigeon Drive the Bus" and "We Are In a Book!" – my daughter LOVES Mo Willems!). Super excited to read it (and put some more of these suggestions on hold). Thanks! I have no small children but now I want to read the book about the pen! Ha-ha. Love your blog. My daughter got the willems book for Christmas, along with two elephant and piggie books. Love them! We have several of the pigeon books too. I'd love a best of post for chapter books for older kids, since I have a second grader read g above grade level and a new reader kindergartner. Btw I put my word verification back on because I was getting hammered with spam. Great list! I really loved And Then It's Spring. I keep fighting the urge to buy it just because it's beautiful. Someday- when student loans are paid and we have more than 750 square feet for the four of us- I will buy that book and it will be displayed, cover out, on a shelf in the playroom. We have simple dreams. Anyway- I was wondering how you keep track of which books are getting buzz throughout the year. Are there certain blogs you read or is there an ALA publication you get? I'd love to keep up with this sort of news. Maybe you've written a blog post on this already and I've forgotten? I subscribe to the Horn Book's blog Calling Caldecottt and the comments over there pretty much encompass everything! Also, the best of lists from all the major review journals at the end of the year usually give a lot of insight to possible winners. Thanks! I will definitely check those out. I got "Green" for my nephew's birthday on your recommendation! I hope it goes over well!! Great list! So glad that you share your nerdiness to benefit the world with the best books. Both my 8 year old and 3 1/2 year old girls loved "Obstinate Pen" – So clever! I really appreciate picture books that play to a large audience and don't dumb down to the reader. Can't wait to see who gets that sticker! I am not a big Mo Williams fan but, I find the Goldilocks book hilarious. We have also liked Blue and Oh No! Green was a little to artsy for my son's taste (although I liked the concept) and Chloe and the Lion was a bit too old for my son currently. The other ones I haven't read. So do you find that the awards go more to the books that adults enjoy than kids? I have found that to be the case with the last few. Frankly, I feel like the Newbery is more likely to go to books adults love rather than the Caldecott titles. I've been pretty impressed with how kid friendly most of them are over a long period of time. Also, do you have any thoughts about the Newbery Medal? Just curious! I haven't read as many middle grade books this year, so I don't really have an opinion for the Newbery. If you're looking for award buzz, check out the Horn Book blogs (they have one for each of the major awards) and a quick google of Mock Caldecott or Newbery will pull up lots of lists from librarians doing their own panels. I loved the Goldilocks book too (gave it to one of my nieces for Christmas!) and I'm adding Chloe and the Lion to my to-read list. I'm on a funny narrator kick right now and that one seems like it will fit right in! You're my kind of nerd! (smile) I'm rather partial to And Then It's Spring. But I do love the storyline of Chloe and the Lion. Can't wait to find out who wins the award!!! I bought Goldilocks for myself for Christmas. I giggle every time I read it. I have been following your blog and the Horn Book for several months now and have really enjoyed all of the book recommendations! My boys are 3 and 5.5 and we have really been enjoying A Home for Bird this week. I personally love Extra Yarn the best of all of the books mentioned on the Calling Caldecott list, but my kids don't love it quite as much as I do. And Then It's Spring is the same way for us. I haven't read them all yet, though, and just added about 8 more to my Holds list at the library! I do not have any children so I am rarely in stores or libraries, looking for books for my own children. However, I am a teacher and so I am exposed quite often to new children's books. I have not read any of your titles; however, they seem to have great story ideas. I am sure that I will be running into them over this year. What a great post on this, I've always wondered about this list, of course I haven't spent much time looking into it. I'd love for you link up with my Cozy Book Hop, as I think many of my readers would love this. If you are interested its open all week, stop by whenever you want. 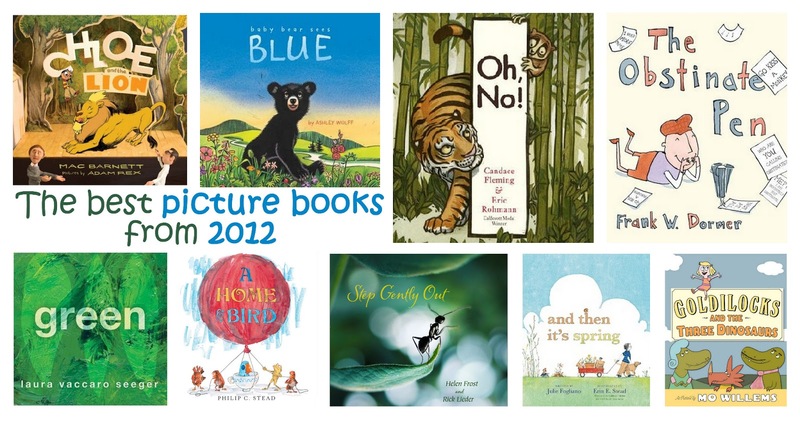 A lot of these books were among my favorites and I think Baby Bear Blue is a top contender. It did not resonate with me as much as the other books, though and I am picking Extra Yarn as my favorite of the year (If I HAD to choose just one. Thanks for sharing your picks with The Children's Bookshelf. Thanks for linking into the Kid Lit Blog Hop! I'm bookmarking this list for our next trip to the library 🙂 Following your blog plus your Twitter and Pinterest! We were pulling for Baby Bear in these parts. Goldilocks made me laugh – did Ella get it at all? Or is it a slightly older kid book? I hadn't even heard of The Obstinate Pen until this post, but now have it on hold at the library. Thanks for the tip! Now that the announcements have been made, I'm curious your response. These sound like cute books for kids. Thanks for your thoughts and the review. BTW-I have 5 giveaways I'm hosting at my blog this week if you want to pop over and check them out. Hope your week is a lovely one! This is a great list! I'm totally curious about The Obstinate Pen – what a great premise for a book! Thanks for linking into the Kid Lit Blog Hop. I'm a new follower (email, Twitter, Pinterest and Goodreads!) Cheers!